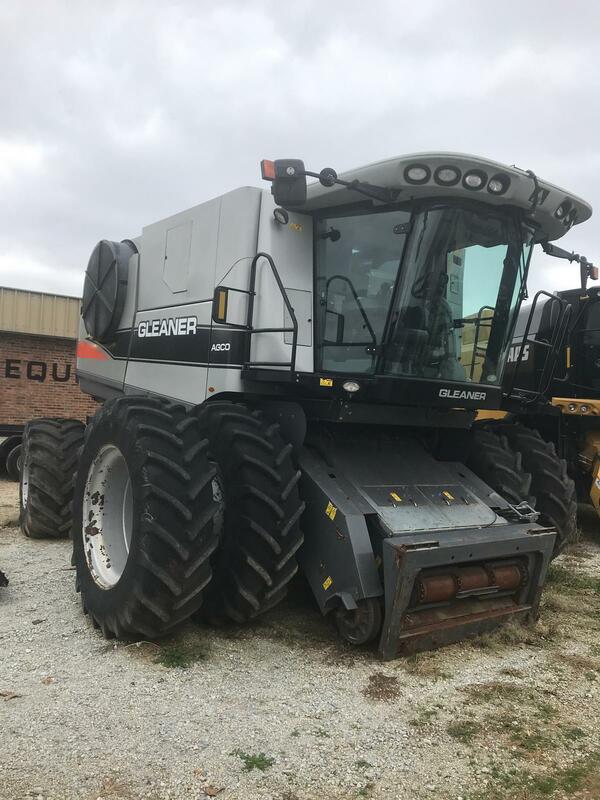 2011 Gleaner A86 for sale in Athens, AL. Haney Equipment Company Inc. The A6 Series axial-rotor line of Gleaner combines come from our familiar tradition of innovation and performance. Our A6 line features some of the highest capacity machines ever built coupled with powerful technology. When the heart of your operation is simply getting the most crop through the machine, Gleaner A6 Series combines are up to every task. Cleaning System - Final crop cleaning and returns separation is done by the cleaning system. As crop falls from the grain pan, it cascades to the chaffer via a cascade chaffer pan. The reciprocating motion of the chaffer and the air from the cleaning fan, float the residue rearward and accomplishes initial cleaning of the crop. The GLEANER A6 Series can be equipped with electric adjustable sieve and chaffer that can be adjusted from the C2000 virtual terminal or from behind the combine. Cleaning System - The transverse-flow cleaning fan, chaffer, and lower sieve make up a closed pressurized shoe assembly. A large volume of air provides screening and pneumatic cleaning. GLEANER A66 includes a 6768 in² (4.36 m²) cleaning area and A76 and A86 include 8296 in² (5.35 m²) cleaning area. Engine - 24 valve cross-flow head with 4 valves per cylinder for increased air circulation. Engine - 30 hp automatic unloading boost. Engine - Bosch common rail fuel injection system controlled electronically for better fuel efficiency by the EEM3 electronic engine management software. 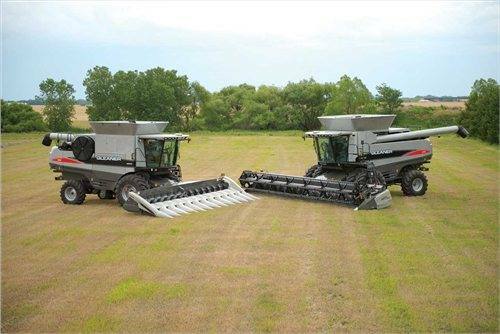 Engine - The AGCO 84CTA engine delivers 300 hp (224 Kw) for the GLEANER A66 and 350 hp (261 Kw) for the GLEANER A76 at 2,100 rpm. When the engine rpm is pulled down to 1,900 rpm a power bulge of 321 hp (239 Kw) and 375 hp (280 Kw) is available. Engine - The GLEANER A86 is powered by a C13 engine that delivers 425 hp (317 Kw) @ 2,100 rpm and a 459 hp (342 Kw) power bulge when the engine is pulled down to 1,900 rpm. Engine - Turbocharging, intercooling, exhaust gas recirculation and high pressure fuel injection to meet Tier III emissions. Engine - Wet cylinder liners which are centrally supported and replaceable. The two central supports reduce vibrations of the liners, eliminating cavitation damage to cylinder liners. Environment - The ComfortTech II cab incorporates a state of the art ISO Bus electronics and a new designed armrest and control with the C2000 virtual terminal attach. New slim cab post increase the front view and combined with the new high intensity stadium Hella cab lights makes to a perfect control center. Other features include system diagnostics, interlock, environmental control, and flex logging of combine functions via the CAN Bus interface with the FIELDSTAR® II system. All GLEANER combines come with the integrated FIELDSTAR II yield-monitoring system to track across the fields as standard equipment. FIELDSTAR II uses yield and moisture sensors, global positioning and the unique color touch screen C2000 virtual terminal. Environment - The GLEANER ComforTech II™ cab features 61.2 ft2 (5.7 m²) of tinted glass and 121.4 ft3 (3.4 m³) of interior volume for a comfortable operating environment. The door entry is 41.5-inch (1,054 mm) wide at the upper section making for a comfortable entry and exit. A large rear cab window gives the operator a clear view into the grain tank. Environment - The GLEANER operators cab offers a new level of comfort and convenience with excellent header visibility, an adjustable air ride seat and a seat mounted control console that is adjustable to fit each individual. Feeding System - The opposing vanes on the feeder supply an even flow of material to the rotor via a conical shaped rotor intake housing. A blended shape rotor transition intake provides a 360° rotor feed. This feature gently feeds the rotor to reduce crop damage while increasing rotor intake capacity. Gleaner Guard™ Warranty - The Gleaner Guard™ warranty is the best in the industry from header to spreader. Nonconsumable parts found to be defective in workmanship or material as delivered will be repaired or replaced for two years from date of delivery to the initial owner regardless of the number of hours the machine has been used. Optional one-year or two-year extended comprehensive warranty packages are available. Grain Bin - A cross auger moves the crop to a large clean grain elevator. Bolt-on rubber paddles carry the grain to the grain tank where a new 12” (305 mm) large bin fill auger evenly fills the large 300 bushel (10,570 L) grain tank in the GLEANER A66 and A76 and the large 350 bushel (12,334 L) in the GLEANER A86 (optional on A76). Grain Bin - Grain tank extensions equipped with quick release latches fold down easily reducing the transport height to 147” (3.73 mm) for storage and transporting. Threshing & Separating - Direct rotor discharge needs no additional beaters to move residue away from the rotor. Direct discharge reduces machine complexity, horsepower consumption, and crop residue damage for baling. Threshing & Separating - The heart of the GLEANER A6 Series is its unique threshing and separating system. The rotor is designed to maximize efficiencies inherent to rotary threshing technology. The patented intake and discharge design and the largest rotor in the industry at 140” (3,556 mm), maximizes rotary threshing efficiency and controls crop flow. The new extended bar rotor configuration for an even better and gentler process of the material. The rotor design threshes the crop during multiple passes, gently allowing the grain to fall through the concaves. Any remaining grain is separated from the crop residue by centrifugal force as the crop passes over the separator grates. The harvesting action of the rotor improves crop quality and reduces losses. Unloading System - The new “Direct High Volume” unloader system lets you spend more of your day harvesting the crop than handling the crop. The GLEANER A6 Series has an industry leading unloading rate of 4.5 bushel/s (158 L/s) which reduces time spent unloading, so more time is available for harvesting, increasing productivity. Unloading System - The unloading auger has ample reach to unload into grain carts and trucks, even with 36' (10.9 m) headers. This feature reduces the chance of headers being damaged or unloading auger hitting trucks or carts. The auger has a 171” (4.34 m) discharge height and a 292” (7.40 m) reach from the center.